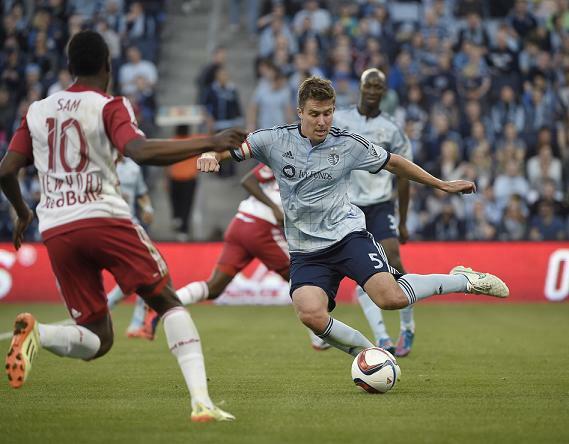 On his way from the Overland Park kid to Major League Soccer champion and FIFA World Cup starter, Sporting Kansas City captain Matt Besler’s composure has served him well, but there was a time when the track was a whole lot more hectic for the defender. As the U.S. Men’s National Team kicked off their World Cup in the Brazilian city of Natal last June, wearing the number five for Jurgen Klinsmann’s side was the first Kansas native ever to feature in the tournament. Matt went on to start each of the Americans’ four games, capping a magnificent rise for the one-time University of Notre Dame standout. The previous December, he had lifted the MLS Cup with Sporting KC – a week before getting married nonetheless – and the hometown favourite was handed the captain’s armband for the 2014 season. The three-time MLS All-Star has understandably attracted a sizeable amount of interest from clubs in recent years and all the more so following his displays at the heart of his nation’s backline on the global stage. However, he was to extend his stay at Sporting Park last July as he signed a long-term Designated Player contract along with teammate and close friend Graham Zusi. Every bit the embodiment of Kansas City’s sporting community, Matt was once described by ex-goalkeeper and teammate Jimmy Nielsen as ‘the kind of defender you love to have on your team’. Way before he ever suited up for his country, or even turned out for the Kansas City Wizards he used to watch from the stands, the childhood Michael Jordan fanatic played to a personal soundtrack of a completely different pace to the one he enjoys today. “Currently, I like country music: my favourite artists are Luke Bryan, Jason Aldean, I like Eli Young Band. Growing up, I didn’t have a specific genre that I listened to but I had two younger brothers and we were a big sports family, so we had all the ‘Jock Jams’ CDs. Representing Notre Dame’s Fighting Irish, Matt appeared at four NCAA Championships and was also an All-American and Academic All-American as a college senior. Back in high school, he had a friend who would tell him about country bands he had heard on his trips to rodeo competitions in places like Texas and Oklahoma. Aside from the aforementioned well-known compilation series he and his brothers Mike and Nick used to blast out, Matt’s mother Diane was responsible for adding another choice to the collection. “The first I had was easily ‘Jock Jams’- I had them all. Also, my mom went to a Sheryl Crow concert and they bought a CD and she kind of gave it to me, so for some reason that sticks out. With the 2009 MLS SuperDraft in its first round, Matt was expecting to be chosen by New York Red Bulls, who had the ninth pick. However, he would be shocked and excited when Sporting KC selected him with the eighth pick, bringing him home and starting what has transpired to be an already hugely memorable pro career. Matt’s progression in recent years has gone hand in hand with the change in fortunes for soccer in Kansas City (both the men’s and women’s game). Sporting KC’s move to the $200million Sporting Park in 2011 coincided with their change of name from Kansas City Wizards and they were Eastern Conference winners that year before being defeated by Houston Dynamo in the Conference Finals. The following year saw the team win their opening seven games, going on to reach the Conference Semifinals, where they were ultimately thwarted again by Houston. 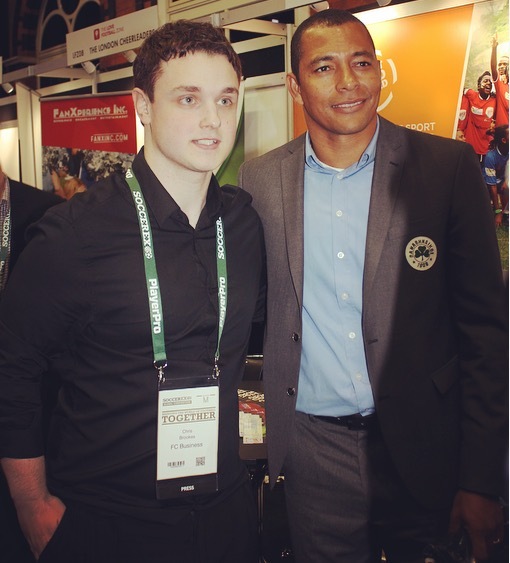 Matt was named MLS Defender of the Year, included in the MLS Best XI, and he also won the Lamar Hunt U.S. Open Cup, scoring in the shootout in the final against Seattle Sounders. One of those who shared in the success Matt enjoyed as an MLS Cup champion in 2013 featured on here last year. Besides carrying the task of leading the goal charge, the English striker in question is also the man for the pre-game vibes, as Matt explains. “Currently, Dom Dwyer is in charge of our music. He does a good job; he has a nice mix of music, but at any point, if the guys get tired of what Dom plays then I think I’m second in line. In his interview on here, Dwyer mentioned how Sporting KC forward Jacob Peterson is an avid fan of country music. With Matt also very much tuned in to that genre, does team DJ Dwyer ever cater to that in the locker room? As Matt wore his nation’s colours in last summer’s World Cup, he was joined in flying the flag for Sporting KC by midfielder Graham Zusi. The Floridian has been an integral part of Peter Vermes’ team in the past few years since he was drafted along with Matt in 2009. Just like Matt, he played in each game for the U.S. in Brazil and he set up goals for John Anthony Brooks (against Ghana) and Clint Dempsey (versus Portugal) during the tournament. In their rookie year, he stayed with Matt’s family and just like his captain he has gone on to become a three-time MLS All-Star. The current campaign is Matt’s seventh in MLS but even he was a newcomer once, and his hometown connections certainly didn’t spare him from the daunting initiation routine. “Yeah, everyone has to sing. I don’t remember what I sang here; I think I did a ten-minute skit, so now when the guys have to sing for 30 seconds they get off easy! Although he played the entirety of the States’ 2014 World Cup run barring the second half of the group opener with Ghana, Matt’s international debut had only arrived in January 2013. He had first been called up a few months prior to that for a clash with Mexico but that first appearance was in a 0-0 draw with Canada and he has since reached 25 caps. This year, it was the turn of a Columbus Crew midfielder to line up for the Stars and Stripes for the very first time at senior level and he had already left Matt extremely impressed with his ability, albeit in the vocal stakes. 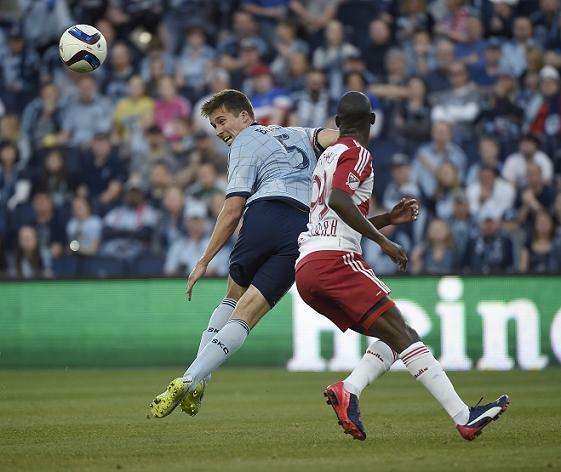 Back when he was drafted by Sporting KC, head coach Peter Vermes had identified Matt as someone who could play a position where they needed a new player, as well as for the fact he was left-footed. The ex-Kansas City Wizards and U.S. defender has since seen the rookie he brought in become one of the most respected and highly-rated players in the league. Matt was given a red card in the team’s opening 1-1 draw with New York Red Bulls this month and consequently had to sit out the 3-1 loss at FC Dallas last weekend through suspension. The 28-year-old is now resuming his efforts to help the side in their quest to go way beyond the Eastern Conference Knockout stage of the playoffs they were eliminated at in 2014. One player now in his third year in KC is a midfielder who featured on here back in his New England Revolution days and the former Hamburg and Derby County man got Matt’s vote when it came to nominating a teammate he would record a song with. While at Blue Valley West High School in Overland Park, Matt played basketball but broke his ankle during his junior year in a tournament and ultimately decided the sport wasn’t his calling. On the soccer field he led his team to the state championship in his senior year, scoring 23 goals along the way. Even back then he was already a role model, with his younger brothers looking up to him. 21-year-old Nick Besler, a midfielder, has begun his own path in MLS this year with the Portland Timbers, while Mike is in law school. Matt’s three MLS All-Star appearances have seen him line up against Manchester United, FC Bayern Munich and AS Roma, with the latter of those games taking place on his home field of Sporting Park in 2013. As mentioned, he tied the knot with fiancée Amanda in December of that year, making the most of the fact that Sporting KC’s season went all the way to the final game and getting himself out of the wedding planning! The sense of belonging and community is something on which great clubs are built and that sentiment has never been lost on Matt. He takes a look back on his years in the game to pick out what he feels he has learned the most and the advice he would give the Matt Besler who was just starting out, if he had the chance to go back. “I think soccer has taught me the importance of preparation. You put in the time and the work to prepare for something and it usually works out, more times than not. Whether as part of a training session ahead of a big game, or just for fun with friends, 5-a-side matches undoubtedly have their own rightful place in the sport. This regular closing question on here asks the interviewee to picture themselves in a small-sided game like this and to select four of their career teammates they would have alongside them. It is down to the player to decide whether they go for the best they have worked with or just a group who have specific qualities for 5-a-side. For Matt, he opted for a quartet of current club colleagues to indicate his focus on the here and now, with a Chilean, an American, a Honduran and an Englishman making up his international mix. “I would choose Luis Marín as my goalkeeper. I’d choose Ike Opara as my defender. Beneath the picture of a headphone-clad footballer stepping off the team bus before a game, the dance-move celebrations, and the odd song release from a player, there’s a whole world of music within the beautiful game. Beats & Rhymes FC began in 2011 and explores music with male and female players from around the globe, as well as delving into various aspects of their lives on and off the pitch in a unique one-on-one.